Alipiri footway is the most used footway. It is of 9 km in length with well laid steps and shelters. There are 3350 steps. It takes approximately 3 to 4 hours to climb depending on your fitness. Pilgrims can keep their luggage at Alipiri luggage center and can proceed to Tirumala. 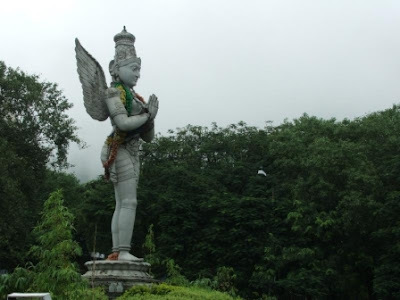 The luggage will reach Tirumala in less than 2 hours usually and the same can be collected by the pilgrims once they reach the hilltop upon producing the receipt obtained while depositing the luggage. As in the case of the Alipiri footpath, "Padala Mandapam" is the base of this footpath to let pilgrims start their trek with a pooja at the Mandapam. On the way there are many interesting places amidst the forest range. Few to name include the deer park and the tall statue of lord Hanuman. If you wish, you can feed the deers with carrots. TTD runs two free buses from the Tirupati Railway station to Alipiri, with a frequency of 30 minutes. Pilgrims who intend to walk up the hills to Tirumala can use these buses. Apart from buses there are many auto rickshaws to Alipiri from Bus stand, Railway station. In the way to Tirumala there is a place called Gaali Gopuram where Divya Darshanam tokens are issued for pedestrians. Pilgrims suffering from chronic illness like BP, Heart and Lung diseases are advised not to climb up the hills on foot. Drinking water and toilets are available all along the foot path. Pilgrims are advised to go in groups and avoid going on foot between 10.00 PM and 4.00 AM.